Col. Moammar Gadhafi spokesman: "The fighting will continue"
Get the latest developments from Libya via our LIVE BLOG. Tripoli, Libya (CNN) -- The six-month battle for control of Libya was all but ended, a rebel leader said Tuesday, even though pockets of fighting remained inside and outside of Tripoli. "The fall of the capital means the fall of the regime," said Mahmoud Jibril of the National Transitional Council. "I wouldn't be exaggerating to say that, within the next couple of days, many other liberations will happen." He added, "In Libya, you say: Chop the head and the veins will dry up." Earlier in the day, the symbol of that head was ransacked as rebels stormed the presidential compound in Tripoli after hours of heavy fighting. Celebratory gunfire rang out as rebels carted off weapons and knocked over statues depicting Libya's longtime leader. But the most-sought-after prize, Col. Moammar Gadhafi himself, remained elusive. Where is Gadhafi? "It doesn't matter," said NTC Information Minister Mahmoud Shammam, who said rebel forces controlled 90% of the country. "In a few hours, maximum a few days, we have a new Libya, a new, liberated Libya." The fighting was not confined to Tripoli. Shammam said battles raged in several cities across the country. "We're fighting in three or four fronts right now," he said, adding, "our troops are limited." Still, the business of transferring power was moving forward briskly, with plans to transfer the power base from Benghazi to Tripoli, he said. "Half of the government will be in Tripoli tomorrow morning," he said, citing the ministries of oil, communications, interior, defense and health. A stabilization team will ensure that the city is supplied with electricity and clean water, Shammam said. In addition, the Zawiya refinery is working. "The whole situation is not so bad," Shammam told CNN from Libya's border with Tunisia. "Things are going to get better every day." But, he added, the work is daunting. Gadhafi left behind no institutions, no political parties, no civil society. "We have to build things from scratch," he said. Critical to the rebels' ultimate success, he said, will be the release of money that has been frozen in international banks. "We need to provide ourselves with a lot of necessities and we cannot do this without money," he said. The rebels' immediate needs are puny compared to what they have lacked for years, he said. "Please, please, please, let the international community know -- we are hungry for freedom, we are hungry for democracy, we are hungry for a state of law and order and we would like everybody, everybody everywhere in Arab countries and in the international community to support us and help us to get that." But Gadhafi spokesman Moussa Ibrahim remained defiant. "Moammar Gadhafi's rule is not just over Tripoli," he told Arrai Television. "Moammar is loved by millions! From the center of Libya to western Libya to the mountains of Libya to everywhere. So the fighting will continue." He said that Libya's tribes had organized a military leadership. "The tribes are organizing and heading to the capital in order to rescue it from gangs," he said in an apparent reference to the rebel forces. In an interview Tuesday with CNN, former Gadhafi aide Bashir Saleh called for an end to the violence. "I appeal to everybody who has his arms to think before shooting -- from our side or from the Gadhafi side. It's time to stop the bloodshed." Asked what Gadhafi had told him during the uprising when he made similar comments, Saleh said, "He say that he has a job and we have to continue our job. Job is to stop the rebellions, and we have the right to do so." 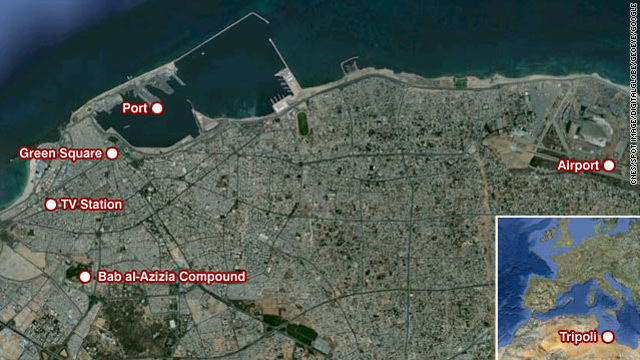 Gunfire was directed Tuesday evening into Gadhafi's compound. Rebels said Gadhafi's forces were firing into the compound. There was no way to confirm who was doing the shooting. A CNN team evacuated the compound because of the incoming fire. "There was tracer fire and we could hear bullets coming past us," CNN's Sara Sidner said. "Everybody was running." Earlier, rebels said they had disarmed and captured some of Gadhafi's forces inside the Bab al-Aziziya compound following an hours-long siege. No members of the Gadhafi family were found there. Some buildings in the compound were knocked down and some were afire. Rebels seized weapons and munitions and carried them off. A senior NATO official said the war was "not over yet, although it's close. We continue to watch for flare-ups from around the country, where there are still going to be pockets of resistance. We are also watching the chemical weapons and Scud missiles to make sure they are not used in the endgame." How soon can Libya export oil? Jibril said it is important to begin a smooth transition immediately. "We're all Libyans, and we're all sons of this nation," he said. "There is no need for any score settling." Jibril said a planned meeting on Wednesday of international leaders would focus on organizing aid for Libya. The meeting will include officials from the NTC, the United States, the United Arab Emirates, Qatar, Italy, France, the United Kingdom and Turkey, he said. The money would go toward paying salaries for Libyans and covering medical treatment for those injured in the fighting, he said. A stabilization team comprising technocrats from the Gadhafi regime is already inside Tripoli working to get the business of running a country on track, he said. "We didn't want what happened in Iraq to be repeated in Libya," he said, referring to the looting and destruction of government offices and records in the wake of the overthrow of longtime leader Saddam Hussein in 2003. Of particular importance will be the re-establishment of the security and military sectors, he said. "We're not focusing on the first layer of command, but on the second, third and fourth. Those are professionals who were not involved in any bloodshed, putting down uprisings, not known to be corrupt or involved in torture practices in the past." What happens to Gadhafi if he is arrested "will be left up to the Libyan legal brains," said Jibril. But he appeared adamant that the longtime ruler would be dealt with by his countrymen rather than handed over to the International Criminal Court in The Hague, which has issued a warrant for his arrest for crimes against humanity. "Libyans are best placed to do this," he said. "We pledge that he will be treated fairly in accordance with the law." The country's top priority is to guarantee the security of the nation's oil wells and get production back on track, he said. But much more remains to be done. "We are talking about rebuilding a whole nation," he said. "Gadhafi was not only just the buildings, it was also the culture. And to get rid of this culture is not an easy task." Doing that will require the dismantling and re-establishment of educational institutions "so that we rebuild a new culture." In Gadhafi's tribal home of Sirte, fighting continued Tuesday. NTC spokesman Shamsiddin Ben Ali told CNN that Sirte would probably fall Tuesday or Wednesday, in a peaceful way, through negotiations. Al Jazeera aired an interview with a rebel colonel who said his forces were in negotiations with Gadhafi forces in Sirte and were considering offering amnesty to any forces who cross over to the rebel side. U.S. State Department spokeswoman Victoria Nuland said a "reliable, affirmative" statement from Gadhafi himself is needed to underscore that "the days of his leadership are over." His whereabouts and those of his family were unknown. His compound had been damaged in recent weeks by repeated NATO airstrikes. Mahmoud Shammam, minister of information for the NTC, said NATO hit targets Tuesday inside the compound. NATO would not comment on specific actions it was taking. Earlier in the day, some Gadhafi forces dressed like rebels and tried to infiltrate rebel forces. In the midst of the urban warfare, loyalties were not always clear. A CNN crew at the nearby Rixos Hotel heard explosions coming from the compound throughout the day, likely the sound of artillery shells being exchanged. Bullets were fired into the windows of the hotel, and the crew holed up inside along with dozens of other international journalists. "We're upstairs. It's very hot in the hotel. We've all got body armor on. We don't know what to expect," CNN's Matthew Chance said. Despite cheers of "victory" in the streets, some rebel officials have said the key to victory will be the capture of Gadhafi himself. Col. Roland Lavoie, a NATO spokesman, said Tuesday he had no idea where Gadhafi was. But he added that it was not relevant. With the regime coming to an end, Gadhafi is "not a key player anymore," he said. Russia's Interfax news agency, meanwhile, quoted the head of the World Chess Federation as saying he had spoken with Gadhafi and his son Mohammed by phone, and that Gadhafi said he was "alive and well in Tripoli and not going to leave Libya." NATO said Tripoli was no longer "under Gadhafi control." As the fighting raged Tuesday, those wounded faced a shortage of doctors, facilities and medical supplies. One clinic "has 40 beds, and all of the beds are taken," said Robin Waudo of the International Committee of the Red Cross in Tripoli. "Some of the people have been treated or discharged and taken to other houses nearby in order to be treated." Around the key city of Zawiya, a half-hour's drive west of Tripoli, tracer fire, anti-aircraft guns and artillery were seen and heard. Gadhafi had had a firm grip on Libya since a September 1969 coup. The rebellion against him began in February and has been aided by NATO airstrikes that began in March, under a U.N. mandate to protect civilians. The Gadhafi regime's fall would follow revolutions in Tunisia and Egypt this year in what has become known as the Arab Spring. A number of other countries in the region -- including Bahrain, Yemen and Syria -- have also seen protests by citizens demanding more freedom and a change in regime. In many cases, these demonstrations have been met with brute force. The Libyan revolt gained momentum rapidly in the past two weeks, with rebel forces launching their push on Tripoli over the weekend. CNN's Arwa Damon, Jomana Karadsheh, Kareem Khadder, Raja Razek, Aliza Kassim and Per Nyberg contributed to this report.